edited by Mary Ellen Konieczny, Charles C. Camosy and Tricia C. Bruce. 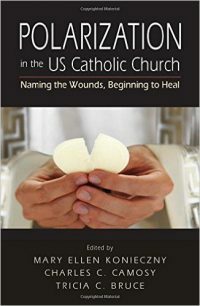 A number of the authors show how the internal divisions within the church all too often reflect the political divisions within American society. Instead of searching for solutions to the problems confronting all Americans and American Catholics, there is a tendency to retreat from reality, a disjunction which can only increase the political polarization of our church and our society. One example is the demise of bioethics in Catholic universities, which ignores rather than seeks to solve serious issues faced by many. The authors, often citing Pope Francis and noting the Focolare movement, offer solutions, calling on Catholics to work toward communities of dialogue rather than disputation. One cites, for example, the joint effort of Rep. Paul Ryan, R-Wisconsin, and John Carr of Georgetown University to create a forum where pro-life and social justice issues, interrelated as they are, could be worked on in common. In such dialogue, seeking common goals to help all in need despite real differences, lies our hope for the future of the church and our country.